Stem: ascending to erect, 2--23 cm, branched above. Leaf: lower opposite, fused at base; upper alternate. Inflorescence: pedicels in fruit reflexed or ascending, +- 0.5 mm. Flower: calyx lobes in fruit +- equal, > nutlets, with appressed, short, and several spreading, long, stiff, straight-tipped bristles. Fruit: nutlets 1.5--4 mm, +- round to obovate; margins +- entire, membranous-winged, wide on 3 nutlets, narrow on 1, +- scattered hook-tipped bristles. Chromosomes: 2n=24. 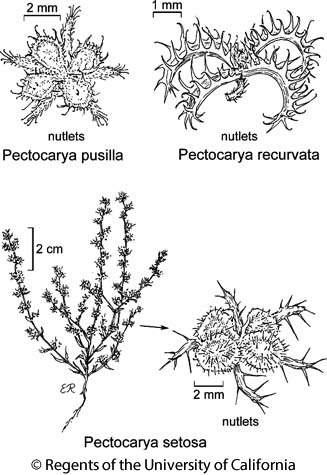 Citation for this treatment: Ronald B. Kelley 2012, Pectocarya setosa, in Jepson Flora Project (eds.) Jepson eFlora, http://ucjeps.berkeley.edu/eflora/eflora_display.php?tid=36534, accessed on April 19, 2019.
s SN, CW, SW, se MP (exc Wrn), SNE, D; Markers link to CCH specimen records. Yellow markers indicate records that may provide evidence for eFlora range revision or may have georeferencing or identification issues. Purple markers indicate specimens collected from a garden, greenhouse, or other non-wild location.